Experience a fast 13.1 mile running tour through scenic Providence. The event presents an excellent challenge for first timers, an opportunity to improve a personal best and a perfect tuneup for athletes preparing for an autumn marathon. The Cerrone Providence Half Marathon course, which is USATF certified starts alongside the State Capitol, winds through the vibrant, ethnically varied and historically rich communities of the city to an exhilarating downtown finish at the Rhode Island Convention Center. USATF Sanctioned, Certified 13.1 miles. Long-sleeved t-shirts to all entrants, medallions to all finishers. $60 race weekend (September 25 and 26, 2004). 12:00pm-6:00pm Health and Fitness Expo-Registration, race number, ChampionChip and T-shirt pickup. Race numbers and ChampionChips are non-transferable. The expo will feature Bill Rodgers, four time winner of both the Boston and New York City Marathons. 6:30am - 7:45am Race number, ChampionChip, T-shirt pickup and baggage check at the RI Convention Center. There will be limited registration on race morning. 7:55am- Race Start. For safety and insurance purposes, no skates, rollerblades, strollers, unauthorized bicycles or support vehicles will be allowed on the course. 11:00am- Awards ceremony at the Westin Hotel adjacent to the RI Convention Center. Markers at each mile and digital clocks at 5 and 10 miles. Six Crystal Spring Water/ fluid replacement stations on the course. Two medical aid stations on the course and one at the finish line. Porta-lets at every other water station and both medical aid stations. Professional race announcements before the start and at the finish. Post race refreshments at the RI Convention Center. The finish line will remain open for 3-1/2 hours after the start. Fast and accurate posting of results in refreshment area. Post race massage therapy and changing areas at the RI Convention Center. Note: Individuals running for a team can enter separately but team declarations must be submitted by September 10 in writing. First 3 finishers in age groups from 19 & under, 20 to 29, 30 to 39, 40-44, 45-49, 50-54, 55-59, 60-64, 65-69 and 70+ men and women. First Rhode Island Man and Woman finisher will receive round trip air tickets to any destination in Florida courtesy of Donovan Travel. 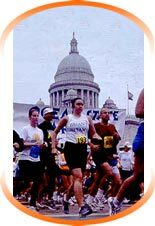 Each 100th finisher will be awarded a $50 gift certificate from Running Heritage of Providence. Special police, firefighter and state police division.